Is the 2014 Isuzu D-Max A Credible Force To Be Reckoned With? There is something about a pickup truck that makes the driver feel a little more macho than piloting your average saloon or sport compact. It’s the ability to haul, tow and go anywhere you damn well please. The 2014 Isuzu D-Max is no exception with its rugged good looks and pulling power, it will give you the delusion of being bulletproof. Isuzu Dmax v. VW Amarok battle of the pick up lease! We currently have 2 great offers on 2 of the best but 2 of the least known pick ups in the UK. The Isuzu Dmax 2.5D 4×4 Double Cab Eiger and the VW Amarok 2.0 Tdi 180 ps Trendline Double Cab. Limited supply on the new Isuzu Dmax 2.5D 4×4 Double Cab Eiger, for only £259.99 + VAT per month, available on contract lease. Price based on 6 + 35 and 10,000 miles a year, though this can be adjusted to suit personal requirements. Get the VW Amarok 2.0 Tdi 180 ps Trendline Double Cab for just £269 + VAT per month. Click here to watch a video review of the VW Amarok. 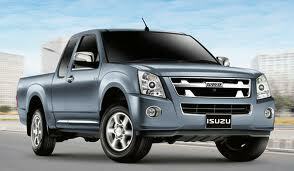 As from June 2012, the new Isuzu D-Max will be available for purchase, lease or finance in the UK, following its release. It will be aggressively styled and powered by a highly efficient diesel engine, ensuring impressive performance with refined interior and power. In keeping with its fundamental change, the Isuzu D-Max offers improvement in performance, quality, efficiency and refinement for the pick-up sector. The Isuzu D-Max delivers in quality and builds on the solid reputation of its predecessors by coming up with the most comprehensive pickup in the Japanese’s company history. The Isuzu D-Max has exceptional load lugging capabilities, towing strength and impressive off- road performance. The interior styling affords drivers a spacious and refined cabin made from high quality materials and state of the art specifications. Isuzu say the Rodeo is ‘the pickup professionals’, unlike other pickups, the Isuzu Rodeo is built from the ground up to take on a challenge in any conditions. The Rodeo is a pickup which is as good off-road as it is on the tarmac. Thanks to its commercial vehicle DNA and decades of Isuzu expertise, the Rodeo can make the toughest of jobs seem effortless and the inaccessible suddenly isn’t. Prices for the 2011 Rodeo line-up range from £12,699 to £22,549 (commercial vehicle on the road), and because of their 1,000 kg-plus payloads, all Rodeos allow a VAT registered company to reclaim the VAT. The Rodeo has been acknowledged as the most up-to-date and sophisticated vehicle in its class with many awards. ‘Best-In-Class’ title from WhatVan? magazine.